With Russians becoming real coffee addicts, sales have doubled over the past five years and made the country an important market for the beverage. For many people around the world, normal everyday functioning can only begin after their morning cup of coffee. Russians were relatively slow to catch onto this trend, not just because good coffee was very hard to come by back in the Soviet era, but because for centuries the country’s preferred non-alcoholic energy beverage has been tea – thanks to supplies from relatively close-by China and India. But things change. With household incomes on the rise and coffee shops such as Starbucks and Costa Coffee springing up everywhere, the coffee market is growing at breakneck speed – reaching a staggering $2.2 billion last year. Russia is now the seventh in the world in terms of serious coffee drinkers. According to estimates by research group Euromonitor, Russia’s coffee market will be expand by 5% annually in real terms through 2016. Russian market opens up, smell the coffee! According to the Organization of Coffee Manufacturers, Russia is the world leader in terms of instant coffee consumption, knocking back a whopping 57,000 tonnes of the stuff per year. Compare this with the UK (30,000 tonnes) and Japan (28–29,000 tonnes). Natural coffee will be the driver for further growth of the Russian market. “When people try natural coffee for the first time, they can really taste the difference,” explains Aleksandr Kolkov, general director of Paulig in Russia. As recently as ten years ago, the instant coffee sector was 10–15% larger than it is today. It has shrunk to 68%, with the rest occupied by whole bean coffee. According to Chanturia, another important trend in the Russian market is the proliferation of companies that process, manufacture and package coffee in Russia. Bringing coffee beans to Russia has become more economically viable after the lifting of import duties on green beans several years ago. Nearly all major players in the Russian coffee market now have processing and packaging capacity in Russia. 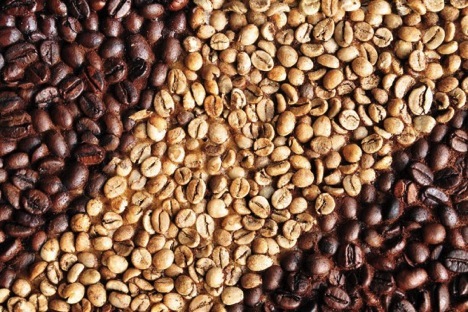 Domestic production accounts for more than 80% of ground roasted coffee, and for more than 50% of instant coffee. America’s Kraft Foods Inc., Switzerland’s Nestle S.A. and Finland’s Paulig Group account for the bulk of coffee production and sales in Russia, even though marketing efforts have ensured that most Russian buyers still associate coffee with its country of origin. “Brazilian coffee” has long become a household name. Obviously, in most cases it means imported beans. Brazil accounts for around 26% of Russian imports in dollar terms and 23% in real terms. In contrast to the tea market, Russia’s coffee consumption is only marginally seasonal. The only difference between summer and winter is that coffee-based cold cocktails, such as Frappuccinos and iced lattes, become more popular in the warmer months. The traditional Americano, cappuccino and espresso are in equal demand no matter what the season. However, according to a poll of baristas at several popular Moscow coffee houses, customers base their choices primarily on the drink’s size. “People often ask for an Americano or a latte just because there’s more liquid in the cup. They couldn’t care less about what kind of coffee it is or how it has been prepared. People don’t ask for espressos very often – only if they need an energy boost,” said barista Nikita. The owner of Moscow’s LookCafe, Sergei Sivkov, also believes that most Russian consumers still perceive coffee as “a beverage to wash down sandwiches”. “Often, the only place you can get a really good quality espresso or cappuccino brewed by a barista is at a professional competition or a trade event. No matter what the price, what you get in mass-market coffee houses is far from what could be considered a rightly made, fine cup of coffee,” he complains. Everybody knows that homemade coffee is considerably different from what cafes or restaurants serve. This depends not only on the barista’s skills, but also on the variety of coffee. Coffee market rules for restaurants and hotels vary substantially from those for supermarkets or other retail establishments. According to Sivkov, the Italians are the unquestionable leaders of the coffee industry. No matter where they buy their coffee, they are unsurpassed in the art of creating new flavours. Still, the end result we find in our cup in most cases does not depend on the bean, or even the price, but on the brewing method. “There are many ways to brew coffee. It depends both on the quality of the coffee machine and, of course, on the barista,” Sergei Sivkov said. “Coffee shouldn’t be an elite beverage. It’s an ordinary product, like fine cheese or pizza. It just needs to be done well. Also, coffee should be enjoyed as a standalone beverage, independent of latte art or accompanying sweets”. That said, the Russian market’s established trends could be put to the test pretty soon. The global market has been jittery because of a failed crop in Brazil, and Russia may feel its impact. Experts are predicting a 5% price increase by the end of the year. The only factors preventing further price growth are the structure of demand and the prevalence of instant coffee in the local market mentioned earlier. The cost of coffee beans accounts for 15–20% of the price of an average jar of instant coffee at most, with the rest coming from taxes, processing, packaging and logistics. The weakening rouble is also a factor, because the bean must be imported – coffee can only be grown as a decorative plant in Russia. Experts are worried that because of the price hike, high-quality Arabica could go to China and Brazil, leaving the Russians with cheaper and decidedly less tasty Vietnamese Robusta.